Whether it’s a wedding, a family reunion or a special celebration, it’s great to be part of the group and spend time to reconnect and have fun. 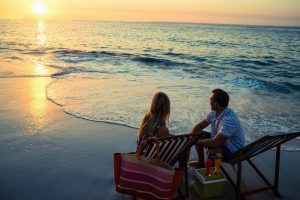 However, as a couple, in a beautiful venue on a romantic island you will be forgiven for wanting to spend some quality time with your loved one. 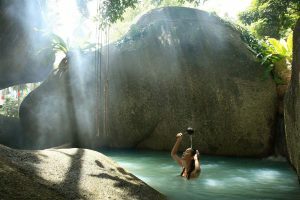 Apart from Villa Kalyana offering couples an array of truly special moments and intimate spaces, Koh Samui has plenty of things for a loving pair to do to recapture the romance. Take the opportunity to witness the sunrise as you stroll hand in hand in the gentle surf along the beach. 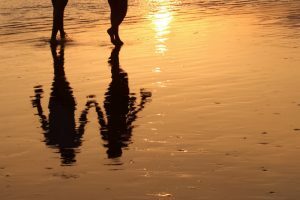 The sereneness of the bay, the cool breezes and nobody else around gives you the chance to focus on your partner, take time to be quiet together and look forward to the day ahead. On return to the villa, enjoy a hearty breakfast on your private terrace and watch the day at the villa start to unfold. 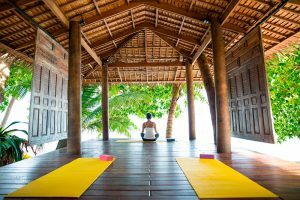 To feed the body and mind, the two of you could try a yoga session with a private, professional teacher. 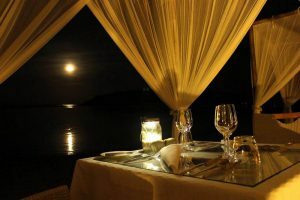 Held in the beach side pavilion it’s a romantic spot overlooking the sea. Many yoga postures are easier when supported by a partner as you help each other to balance, stretch and tie yourself in knots! Trying something new together is fun and you bond as you make shapes and take time out to reconnect. Following the yoga session, the pavilion becomes a massage venue. A masseuse can be arranged to be on hand to soothe and relieve aching muscles. Try an Aromatherapy massage where your olfactory sense is given a gentle work out! Choose your delicately mixed essential oil to suit your mood, lie back next to your partner and drift off as the expert masseuse strokes and kneads to revitalise your muscles. If you fancy a real treat, then head for Tamarind Springs Forest Spa and spend the day pampering yourselves in lush tropical surroundings. How can you resist a Steam and Dream package, where you drift between the two outdoor herbal steam caves and the cooling plunge waters and then choose a massage to suit your mood. Check out their website https://www.tamarindsprings.com/spa-treatments.html for more information. Take some time out to nourish you soul with a visit to Laem Sor temple for a monk’s blessing. Make sure you take off your shoes before you enter the temple and kneel before the monk who sits on a small stage. 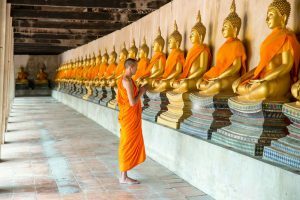 With your hands in prayer position and your head down, the monk chants the blessing, wishing you happiness, health and good fortune. 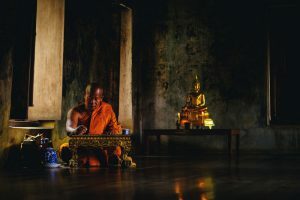 A sprinkle of holy water to make sure the bad spirits are dispersed, before the monk ties a colourful string bracelet. The ‘sai sin’ has been blessed and is believed to channel good karma through to you. You’ll leave with a sense of peace which will stay with you for the rest of the day. It is expected that you will put a few coins in the collection box. It’s undisputed that sunset is the most romantic time of the day, so during your stay take some quality time to watch the sun dip into the horizon. To get a different perspective on Samui head to the Air Bar in Baan Taling Ngam for an intimate cocktail hour for two. Set high up on the rocks, The Air Bar is a classy joint for any time of the day. It only seems right to try their signature Royal Samui Sunset cocktail as a sundowner! A very tropical mix of pineapple and locally brewed rum, expertly crafted by the professional mixologists. Once the sun goes down, a live saxophonist and singer serenade you with gentle Jazz numbers, completing your romantic evening.It’s undisputed that sunset is the most romantic time of the day, so during your stay take some quality time to watch the sun dip into the horizon. To get a different perspective on Samui head to the Air Bar in Baan Taling Ngam for an intimate cocktail hour for two.Set high up on the rocks, The Air Bar is a classy joint for any time of the day. 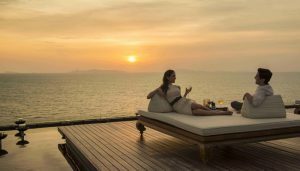 It only seems right to try their signature Royal Samui Sunset cocktail as a sundowner! A very tropical mix of pineapple and locally brewed rum, expertly crafted by the professional mixologists. Once the sun goes down, a live saxophonist and singer serenade you with gentle Jazz numbers, completing your romantic evening. Make sure to take advantage of the 2 for 1 Happy Hour cocktails! Koh Samui is blessed with a myriad of neighbouring tiny islands all waiting to be explored. From Thong Krut village or through the villa concierge why not charter a traditional long tail boat just for the two of you? Pre-order a picnic with the villa manager, pack your beach gear and hop on board. Your captain will find a secluded, deserted beach on one of the neighbouring islands where the two of you can while away a few hours together swimming, beachcombing or just chilling on the beach. On return to the villa, continue your private beach experience. 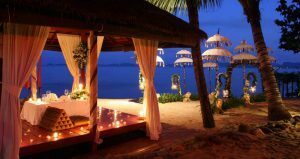 Choose a tranquil spot along the beach, settle down into a couple of comfy cushion surrounded by gentle candlelight, uncork your favourite bottle of wine and hand in hand enjoy the peace of the end of the day.Koh Samui is blessed with a myriad of neighbouring tiny islands all waiting to be explored. From Thong Krut village or through the villa concierge why not charter a traditional long tail boat just for the two of you? 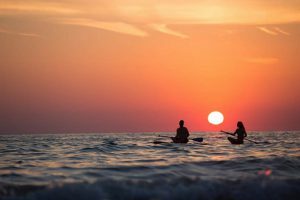 Sunset paddle boarding is a lovely way to see the sunrise or sunset from the sea as you glide along the south coast. Stop side by side, bob up and down and enjoy the spectacular colourful hues as they dance on the ocean. If you are new to the sport and fancy a guided tour Paddle board Samui offer night tours. It’s a novel way to see the dazzling nightlife spectacle of Koh Samui from a different perspective. The boards are fitted with LED lights so you can bob around together investigating the sea creatures below you. Alternatively, hire a jet ski and take off for your own private round the island tour. Paddle boards can be arranged and delivered to the villa. 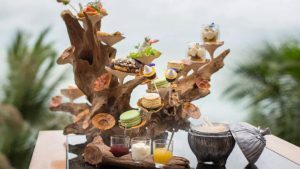 High tea is not the first thing you think of on a tropical island, but KOH Thai Kitchen and Bar at the Four Seasons puts on a very special one. Set high on the cliffs, the view over the ocean and the surrounding jungle are perfect to accompany your tea. Handpicked beach pieces of driftwood are used to display and serve the array of tasty morsels. If you fancy something stronger to toast your loved one, then a champagne high tea is available! The tea includes sandwiches, warm scones and cakes and pastries to die for. You can select from the following mouth-watering options: smoked salmon bagel with cream cheese, grilled minced chicken skewer, fresh rice paper roll with prawn, crispy fried vegetable spring roll, traditional scone, mango scone, ginger lime sorbet, pistachio passion cake, yuzu nut tart, hazelnut crunch bar, Greek yogurt and chocolate lollipop. Best to book in advance. Zazen is located directly on Bophut beach and has been thoughtfully designed to maximise peace and romance. The extensive Thai menu is full of delicious options which are freshly prepared and served with grace and a smile. It’s a popular place so reserve your table in advance. Treetops Sky Dining and Bar, at Anantara Lawana resort, is a unique restaurant and you’d find it hard to find a more romantic setting for your night out. The tables are set on high in the tree tops, hence the name, affording stunning views as you dine. Try The Candlelight Degustation for a selection of fine foods as you cosy up in your private gazebo. 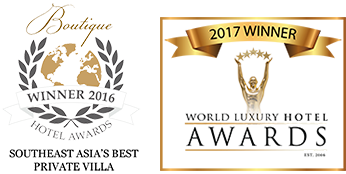 Join our mailing list to receive the latest promotions and news from Villa Kalyana.